Society has long protected traditional concepts through institutions such as marriages. Until recently, unmarried women were gazed with suspicion, as if they lacked something. The dynamics have however changed and today you tend to visualize ability more than structure. Women are growing out of tradition-ridden complex and are enjoying the new state of freedom where they merit a choice. Don’t Say I do! Why Women Should Stay Single a new book by Orna Gadish is an illuminating beacon in this sphere. Truth be told, marriage is no longer the ultimate objective for a woman. Now, she revels more in assessing and imposing her identity. Whether she reaches the stars singly or in cohabitation is altogether her choice. Cultural mores have accepted live-in relations as order of the day. The postmodern woman can look forward to personal space and freedom of self-actualization, independent of how she runs her life. This has given a new lease to unmarried women, divorced ones or those troubled with sickening partners. Gone are the days when women had to stick through thick and thin with their husbands for fear of social stigma. The trend is such that some women are now having kids out of wedlock and enjoying their exhilarated status. Don’t Say I Do! comes up with anecdotes and true stories of American and Western women who carved their entities and realized their passions while remaining single. This is not to suggest that they abstained from sexual pleasures or deferred to explore other tenets of life. The book verily transcends the lives of single women, unmarried women, unhappily married women, and divorced women to other orbit, where there is enough scope for their financial, physical and psychological independence. It is notable though, that some unmarried women, specifically in countryside, are still quite bothered about their existence. They cannot open up to the idea of cohabitating with men or to engender physical relationships with men. Hence, Don’t Say I Do Why Women Should Stay Single is a sterling effort into opening a woman’s eyes to the fact that the world now is too busy to bother. Almost half the US marriageable population is relishing their unmarried status; something that was untenable, a few decades ago. 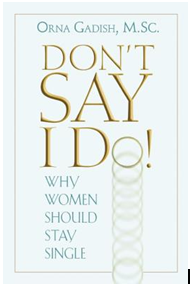 As a women seeking self-realization, positive transformation of life, benefiting choices and sea of opportunities available for modern western women, you will get a tremendous positive vibe from reading Don’t Say I Do! Why Women Should Stay Single and will be delighted to note that marriage is no longer the greener pasture. Apparently, this ideal of the fifties has long gone. As a woman, you will gain in confidence, self-assurance and self-respect, whether you are in a current unstable relationship, an unhappy wedding, or just an unmarried woman by choice or happening—to carry on with your life and lay more emphasis on its dynamics rather than your current conjugal status. Lay your hand on Don’t Say I Do! Why Women Should Stay Single and get enlightened on choosing the right pattern of life. It’s purely your decision whether to be in a relationship or not, stay single, or get married, cohabitate , create a family, and have and raise children. As a woman, you have the right and choice to engage yourself in procreation or recreation. The puritan rigidity has marvelously relaxed to the degree that women are agenda setters now. A good book is much like an extended idea, and ‘No force on Earth can stop an idea whose time has arrived’. Book your copy from Amazon now, because you deserve this enlightening experience!